I [Dr. Hah] look forward to sharing some approaches that attendees can use to successfully achieve opioid cessation in their patients. 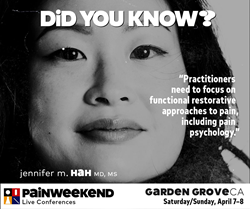 Come to PAINWeekEnd on April 7-8 at the Hyatt Regency Orange County, 11999 Harbor Boulevard, in Garden Grove, California. It will be an educational and exciting 2-day program providing busy clinicians and allied healthcare practitioners with 12.0 hours of relevant, practical instruction in the management of chronic pain. Other courses to be offered at PAINWeekEnd Garden Grove include Falling Down the Rabbit Hole: A Primer for Chronic Pain Management and Substance Abuse Disorders; Crisis=Opportunity: Reducing Medication Burden While Managing Chronic Pain; Medical Efficacy of Cannabis Therapeutics: Focus on Pain Management; The 411 on Nonprescription Analgesics: When to Hold ‘Em, When to Fold ‘Em; Pain Diagnostics: Clinical Pearls to Improve Common Tests for Pain; The Role of Advanced Practice Providers in Chronic Pain; 3's Company: COX-2 Inhibitors, Medicinal Marijuana, and Opioid Prescribing; Pain Pathophysiology Unraveled; and Extended-Release and Long-Acting Opioid Analgesics: Risk Evaluation and Mitigation Strategy (REMS). Online registration fee for this PAINWeekEnd Conference: $199. PAINWeekEnd registrants may register for the 2018 PAINWeek National Conference, September 4-8, in Las Vegas, for $200 off the current online published price.